The cabin itself is up-to-date with running water and power. The cabin boasts of an open floor plan with 1 queen bed, 1 single bed, 2 sofas and 2 futons. The loft has a double bed that would delight the younger ones. 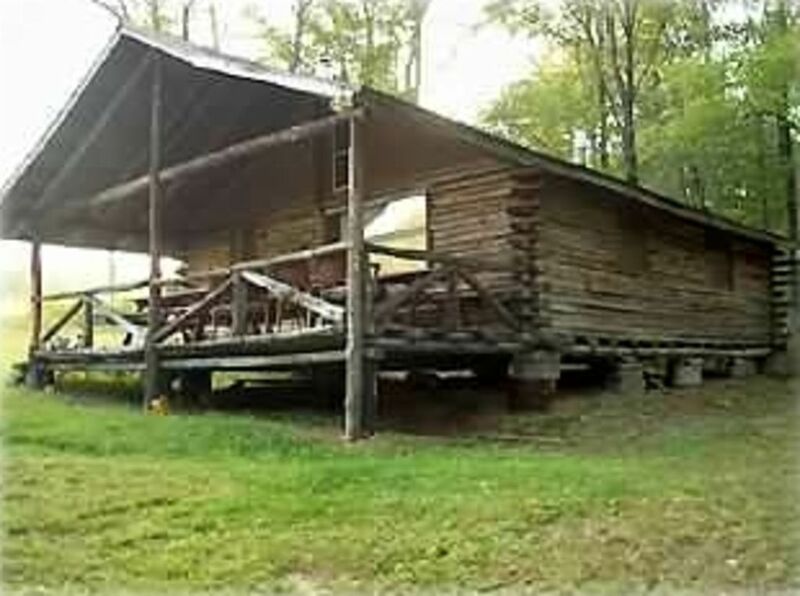 The cabin comes with a full kitchen which includes a full-size refrigerator, a microwave, and a stove/oven (electric). The bathroom has a shower and a flush-able toilet. Heating is provided by a non-vented gas fireplace. Sleeps 7 comfortably. The lake is stocked with Bluegills, Catfish, Bass and the like. Fish from the shore, dock or use our small rowboat and oars (Life Vests required - bring your own). This is the perfect cabin for a romantic retreat, family vacation, or a sportsman’s outing. Whether you are sitting on the front porch listening to the nature or watching wildlife walking across the front yard, hiking, or mountain biking on property or enjoying a dinner cooked over the fire, the cabin offers a beautiful, rustic escape. Plenty of room to roam the woods, and also to sit back and relax. The cabin is close to city but very quiet and exclusive. Pets are welcome for a fee. Deer, black bear, grouse, rabbit, coyotes, bobcat’s squirrels and turkey are regular visitors to the property. Amenities provided include satellite TV ,a DVD and VCR, board games, books and unlimited local calls. If you get bored with resting and relaxing you can take a trip to Wellsboro, PA to see the Grand Canyon, or head to Corning, NY to see the Corning Glass Museum, Rockwell Western Museum, or to Elmira for the soaring museum and glider rides. Waverly, NY has an Indian artifact museum that is very interesting. Finger Lakes Wineries, NY is a perfect day trip from the cabin. The cabin is approximately 1/2 a mile off the main road and the access lane to the cabin is still a little rugged. During the winter months we engage a plowing service. However, if the area experiences ice or heavy snowfall, the road may become difficult to keep cleared and not well suited for 2WD vehicles. As a result, during the winter months its safer for the guests to have an AWD or 4WD vehicle. private 5 ac lake. No other cabins. bring calling card as all calls are long distance. Non-vented gas heater with glowing logs, Phone available - please bring a calling card as most calls are long distance, Camp fire ring in place. We furnish wood for a fee! If ther is a six star raring, this is it. Rustic but with all you need. Absolutely lovely land. Great fishing for the whole family. Very private but close enough to the stores. This is a great place to spend quality time with your family and just relax. We loved our vacation very much and look forward to coming back. The cabin and property was just what I was looking for. Wonderful peaceful setting. We enjoyed the cabin and surroundings. A nice place to get away from everyday life. Awesome place to kick back and relax ~ rustic but comfy! Something out of an old western!!! row boat and oars are furnished, bring your own life preservers. We now have a dock for ease of getting in and out of the boat. We are not in a gated community, but have 45 ac to roam on. There are several large lakes nearby for boating. Bring your own. Horseback riding and rafting are nearby. Free swimming at Mt Piscah (pool). Snowmobile and 4 wheelers are allowed. Bring your own. No big game hunting. Camp fires are allowed. We expect you to leave the cabin as you found it. We will wash the linens, you should wash your dishes. We have a cleaning lady that has 2 hours to remake beds and clean between visitors. We appreciate your help. We want you to have a good time but not destroy our property. Please clean up after your pets so the grounds are clean for the next visitor.